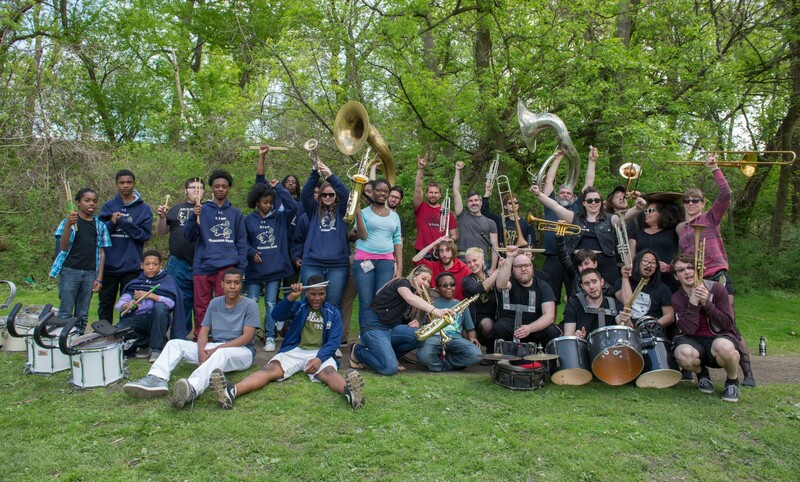 For one day, Pittonkatonk will transform Schenley Park into a whirling convergence of horns, trombones, drums and barbecue. The all-ages brass music festival returns for its second year, this time with even more local and touring bands, kid-friendly activities and handmade Serbian sausages. Last year’s Pittonkatonk saw nearly 700 people, including about 100 performers. This year’s festival will welcome national acts including: What Cheer? 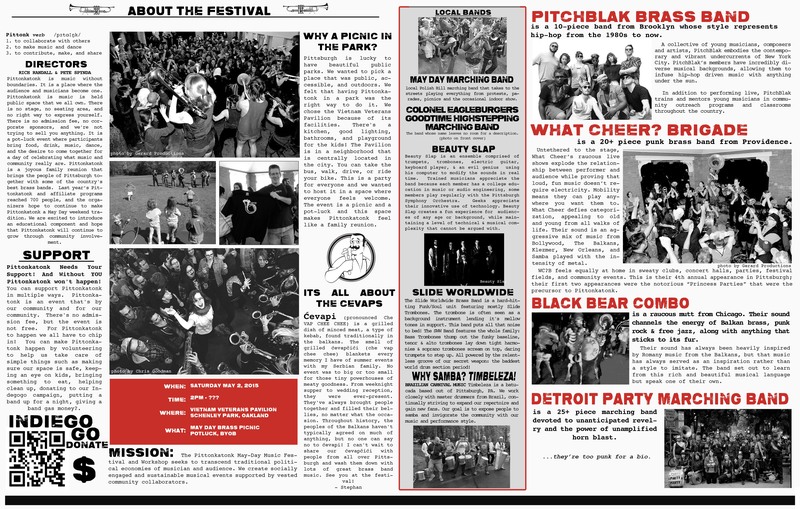 Brigade, from Providence, R.I.; New York’s Pitchblak Brass Band; Chicago’s Black Bear Combo; and the Detroit Party Marching Band. Local acts Beauty Slap, May Day Marching Band, Slide Worldwide and Col. Eagleburger’s Goodtime Highstepping Band will also perform, along with Pittsburgh-area high school marching bands. Like most grand plans, it all began one night at the Brillobox. Fast-forward a couple of decades and Spynda is now one of the city’s most prominent event producers and DJs. He’s responsible for Pandemic, Weather Permitting and programming the Bayardstown Social Club. “Pete had a reputation for making stuff happen,” says Rich Randall, an associate professor at Carnegie Mellon University who looks at music, technology and culture in the 21st century. Randall was wrapping up a project for CMU’s Center for Arts in Society and had an idea for something new — a May Day event focusing on music and labor. He and Spynda chatted upstairs at Brillobox, and Spynda thought about the sweaty, raucous What Cheer? Brigade shows his friend Jason Dunbar had been putting on in his Highland Park garage: donation-based attendance; explosive, genre-defying sounds; lots of eating and drinking and dancing. “Those Dunbar parties were really the precursor to Pittonkatonk,” says Spynda. The focus of Pittonkatonk is on community. It’s about bringing together people who might otherwise never convene, and blurring the line between performer and spectator. There’s no admission fee, there are no food trucks, and there’s no stage or sound system. But the magic doesn’t come without effort — this year’s Pittonkatonk is the fruit of many folks’ labor. Planning has been underway since October, and the co-directors’ gratitude is flowing for everyone who’s helped, including the mayor’s office and Citiparks. Then there are the individuals who are: making food; housing musicians overnight; lending parking permits for bands’ vans; and donating to the festival’s IndieGoGo campaign, which runs through May 6. When it comes to Pittonkatonk, there’s a lot to be excited about — from plum brandy and impromptu crowd-surfing to activities hosted by the Children’s Museum of Pittsburgh and the Pittsburgh Center for Creative Reuse. What Spynda and Randall are most excited about, though, is the educational program that’s new to this year’s lineup. “We want to show kids there’s life outside of the high school marching band,” says Spynda, who hopes he can melt today’s teens’ minds with music the same way his was. Headliner What Cheer? Brigade will be in to town early for a three-day workshop with the Hill District’s University Prep Junior and Senior High Marching Bands. The program will provide students with insights into the business of touring and working as a full-time musician, while exploring the role of music in activism and change. The partnership will culminate in a collaborative performance at Saturday’s festival. Spynda and Randall have applied for a grant through the Sprout Fund’s Hive Fund for Connected Learning, and hope to turn this pilot program into an even bigger outreach effort next year. The Pittonkatonk is an all-day brass band party. Click here to sign up for one of our email newsletters. Wednesday, April 29, 2015, 9:00 p.m.
Brass band music has a bit of a stodgy reputation in America, where we’ve become accustomed to seeing it at recital halls, high-school pep rallies, holiday parades and almost nowhere else. In other parts of the world — and even pockets of the States, like New Orleans — it’s the opposite. It’s loud, it’s in the streets, it’s the soundtrack to protests and wild, all-night weddings parties. It’s bound to tradition, and constantly absorbing the sounds and styles of the moment. There’s no better place to spot the difference than at Pittonkatonk 2015: A May Day Brass BBQ Picnic on May 2 in Schenley Park. There’s Brooklyn’s hip-hop heavyweights, the Pitchblak Brass Band, who wanted to see what rap would sound like with live brass and drums. There’s the What Cheer? Brigade from Providence, R.I., who evolved out of that city’s renowned punk-and-experimental-noise scene, incorporating everything from fiery Balkan brass to funky New Orleans second-line. There’s Black Bear Combo from Chicago, who take that city’s long history of intertwined Eastern Europe musical styles and add experimental energy lifted from punk rock and free jazz. Beauty Slap, from Pittsburgh, adds electronic beats and guitar to a full brass section and are the only band with anything amplified. Then, there’s the spontaneous, roving instant-party that is the Detroit Party Marching Band. Brass needs no amplification, so if the band wants to move, they move. If they want to jump on the table, or march out into the street, they do it. No cords keep them anchored in place. There are two local high-school bands on the roster this time, U-Prep (Pittsburgh Milliones, University Preparatory School) from the Hill District, and Marion Center High School from near Punxsutawney. Adding an educational component was a big goal this year. Members of the What Cheer? Brigade recently did a workshop at U-Prep in the Hill District. “We wanted to work with some local high-school bands, to talk about being a mobile brass band and the opportunities you have. … How you can make a statement with your music, you can have a message with this music, and do it in a positive way. If something happens in your neighborhood, or if there’s a political thing you want to talk about, you can do it through music,” Spynda says. The U-Prep band will perform a collaborative set with the What Cheer? Brigade. Pittonkatonk has been financed largely through an online crowd-funding effort at indiegogo.com. It’s also a potluck, so patrons are encouraged to bring food. Michael Machosky is a staff writer for Trib Total Media. He can be reached at mmachosky@tribweb.comor 412-320-7901. Post Gazette Article about our Fundraiser.. Prepare to put away some pierogies. Brandon McCarthy, brewmaster at Rock Bottom Restaurant & Brewery in Homestead, is behind a fundraiser there tomorrow night (6:30 to 9:30 p.m. Wednesday, April 22) where he’ll serve halushki with noodles he made from scratch, more than 40 dozen pierogies from Forgotten Taste in Wexford, 50 pounds of kielbasa, and sauerkraut. Proceeds will benefit Pittonkatonk, a free potluck picnic and brass music festival that will be held May 2 at the Vietnam Veterans Pavilion in Schenley Park. Tickets are $10 for all-you-can-eat food; the beer to wash it down is sold separately. There will also be some raffle baskets, including the top prize, a “Pittsburgh Sammitch Basket.” Mr. McCarthy asked several sandwich shops to donate a gift certificate for a single sandwich, figuring this small outlay from a lot of different restaurants would make for a cool prize. But some restaurants chose to take it over the top. Union Pig & Chicken contributed a certificate for an office party’s worth of sandwiches. Alfred’s Deli in Polish Hill gave 10 sandwiches. Other contributors include Thin Man Sandwich Shop, Oh My Grill, The Steer & Wheel and Spoonwood Brewing. Pittonkatonk, he said, brings back the feel of the ethnic social clubs that used to dot Pittsburgh, where in the summertime, hundreds of people would show up for potluck picnics. Admission to Pittonkatonk is free; attendees are asked to simply bring picnic food to share. Read more about the Pierogi Fundraiser on Facebook. Pittsburgh loves the merging of the old and the new and Pittonkatonk is no exception. This daylong brass band festival organized by Rich Randall and Pandemic’s Pete Spynda may seem like a newfangled hipster event but it’s actually a modern homage to a Pittsburgh classic. “With Pittsburgh’s rich Eastern European history, an event like Pittonkatonk continues the traditions of the old social clubs but hosts it in a public forum for all ages and walks of life to enjoy,” says Spynda. 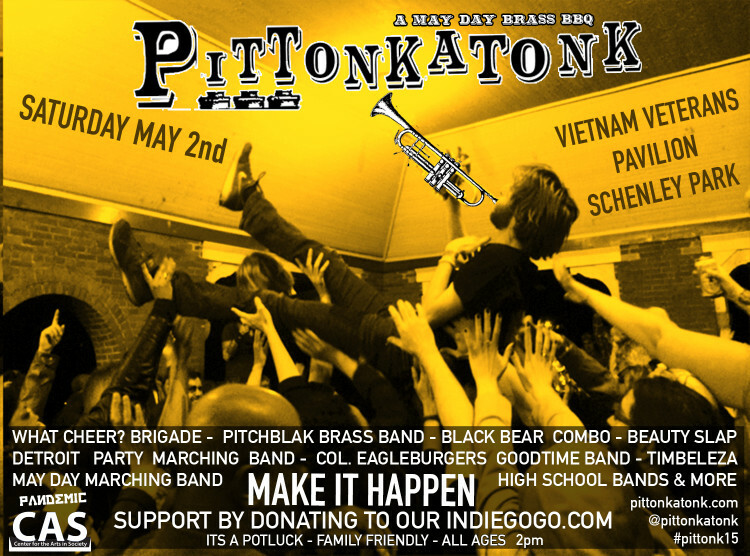 PITTONKATONK: A Pittsburgh May Day Brass BBQ. When Pete Spynda discovered Balkan brass music a decade ago, it was a personal revelation. “I was like, ‘This is what I’ve been searching for my whole life,'” he says. “I was just struck.” Since then, he’s worked to bring others the same experience, first through the long-running global-music dance night Pandemic and, more recently, bringing live Balkan brass bands to Pittsburgh. 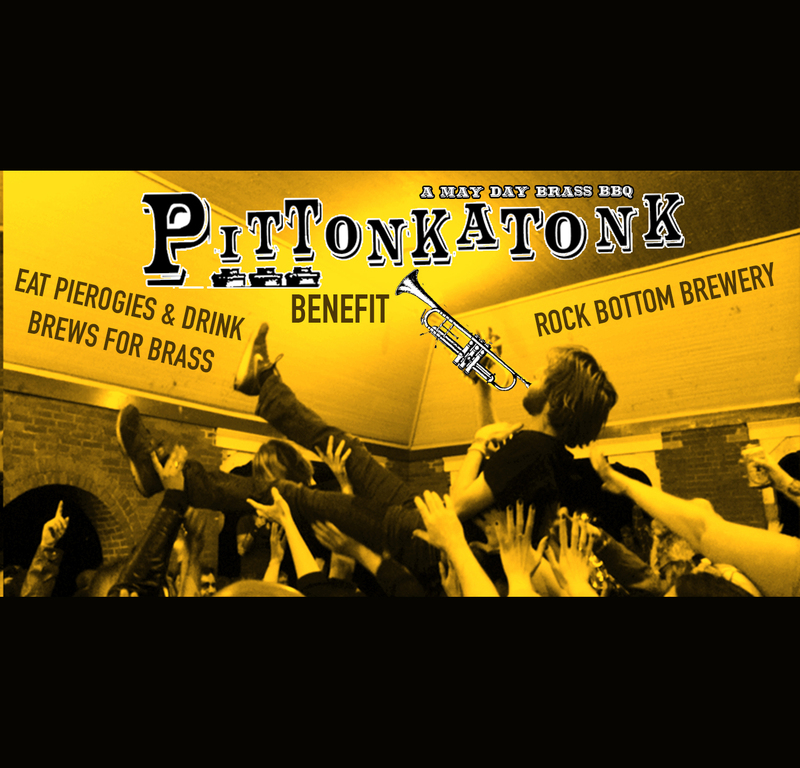 On Sat., May 3, Spynda hosts Pittonkatonk: A Pittsburgh May Day Brass BBQ. Modeled loosely on similar festivals in other cities — Honk in Boston and Pronk in Providence (Pittonkatonk is a localized play on those names) — the event features eight national and local brass ensembles. The Pittonkatonk lineup represents the genre’s variety. A band like Chicago’s Black Bear Combo, for example, tends toward the traditional, while Detroit Party Marching Band and Providence’s What Cheer? Brigade — with 30 and 18 members, respectively — bring in elements of contemporary pop, ’90s hip hop and jazz. Spynda describes locals C Street Brass Band, a group of CMU students, as “virtuoso musicians,” while the May Day Marching Band has a niche playing political events, like protests. In the future, Spynda would like to expand the range further, including some New Orleans brass or even a high-school marching band. While Spynda has hosted similar events in the past, this is the first time he’s put together something of this scale. “I felt like it was time that we gave Pittsburgh its own festival.” He set up an Indie Go Go fundraising campaign to help cover food, venue fees, travel costs and other expenses, but ultimately, Pittonkatonk is a labor of love. 5 p.m. & 3 p.m.
Cambridge has Honk, Providence has Pronk and now Pittsburgh has Pittonkatonk Brass Festival. The brainchild of Pittsburgh-based DJ, promoter and designer Pete Spynda, the lively two-day festival kicks off on Friday, May 2nd at Brillobox, with a May Day Music and Labor Roundtable from 5 to 6:30 p.m. Free and open to the public, the discussion will explore a wide range of topics, from how labor issues impact musicians locally and globally to DIY practices and the Internet’s problematic relationship with musicians. Six panelists will share diverse opinions and experiences and then open the discussion up to the audience. Presented by The Center for Arts and Society, The Listening Spaces Project and Pandemic, the discussion will be followed by a free party featuring performances by MC Boogat (Montreal) and DJ Pandemic Pete (Pittsburgh). Pittonkatonk turns up the volume on Saturday, May 3rd, with its main festival attraction at the Vietnam Veterans Pavilion in Schenley Park. Part music festival, part grassroots potluck and family BBQ, Pittonkatonk boasts an impressive lineup of local and national bands bringing the brass. Free and open to all ages, the concert starts at 3 p.m. 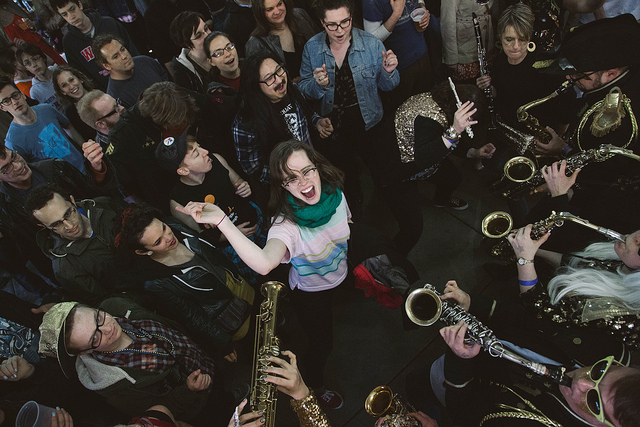 Featured national acts include the Providence, RI-based 18-piece brass punk band What Cheer? Brigade, a Pittsburgh favorite which blends traditional Balkan brass with samba, hip hop and Nola sounds; the funky 27-piece Detroit Party Marching Band, who are just back from a tour of Europe; and the Black Bear Combo, a prolific 8-piece Balkan brass ensemble from Chicago, IL with with roots in the Pittsburgh area. 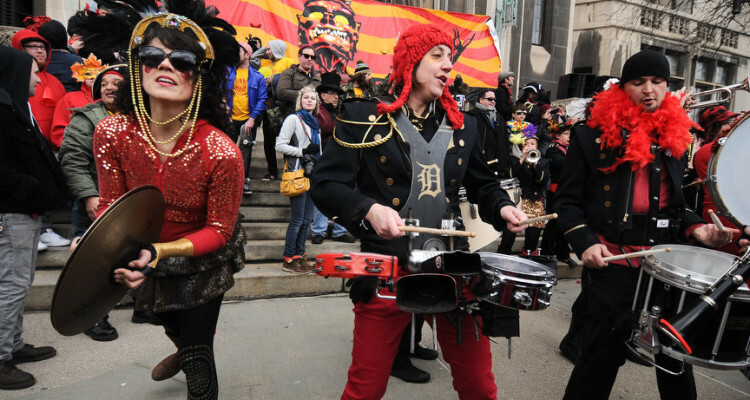 Representing the home turf will be the high-octane samba group Timbeleeza; Pittsburgh’s favorite parade collective, the May Day Marching Band; C Street Brass featuring musical talents from Carnegie Mellon; and the festive Colonel Eagelburger’s Highstep Goodtime Marching Band. Pittonkatonk is run by a dedicated crew of local volunteers. To support the event and get involved, contribute to the festival’s Indiegogo Campaign. Pittonakatonk is Sat., May 3 at 3PM at the Vietnam Veterans Pavilion in Schenley Park. 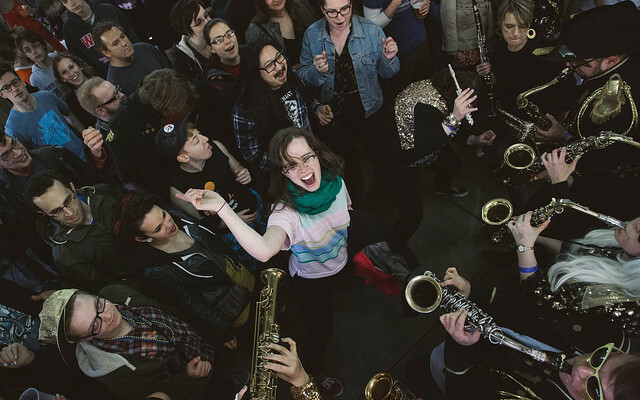 For Pittsburgh music fans who can usually find local bands that hit at many different points across the sonic spectrum, the city’s growing brass scene has been a sight to behold. Coupled with the globetrotting DJ sets that regularly bring Balkan brass music to the dance floor with the first Friday Pandemic get-downs at Brillobox, bands like eight-piece brass/accordion/percussion ensemble Lung Face Feet have been steadily growing followings with their energetic take on Eastern European folk music. Now, local DJ/Pandemic host Pete Spynda has taken his love of brass music and turned it toward organizing Pittonakatonk, a May Day BBQ and mini music festival that will feature both local and national world music groups for a free concert Saturday, May 3 at the Vietnam Veterans Pavilion in Schenley Park. Along with Lungs Face Feet, Spynda has corralled local batucada (Brazilian/African percussion) group Timbeleza, Chicago-based “brass mashup Balkan dance” ensemble Black Bear Combo, Providence, RI’s 19-piece brass group The What? Cheer Brigade, the nationally renown Balkan-New Orleans brass influenced Detroit Party Marching Band, and a few others. For Spynda, the time was right in Pittsburgh to get brass music out of the 21+ music clubs, move it to a more communal space, and put the city’s scene on the map. The event is free and while BBQ will be available, attendees are encouraged to bring a food dish of their liking and participate in the potluck. For more information, visit Pittonakatonk’s Indie GoGo crowdfunding page (they raised $3,000 to help with costs that are broken down into a nice pie chart), or visit the Facebook event listing here. Wednesday, April 9, 2014, 3:42 p.m. If we know anything about the group of small states and peoples in southeastern Europe known as the Balkans, it’s that they don’t always get along. The word “Balkanization” has even come to signify disintegration of states into ever-smaller fragments, because of centuries of intractable ethnic, religious and territorial conflicts. But there’s another thing that this unlucky part of the world is known for — a brand of exuberant, exciting brass-band dance music. The movie “Brasslands,” opening this week at Pittsburgh Filmmakers’ Melwood Screening Room in Oakland, explores this thriving culture at the source. It follows several competitors at the world’s largest trumpet festival and competition, as half a million fans swarm the small, Serbian town of Guca. “Brasslands” follows the returning Serbian champion, 25-year-old trumpeter and bandleader Dejan Petrovic, and upstart Roma Gypsy trumpet virtuoso Demiran Cerimovic who fights an uphill battle against virulent prejudice just to make a living. “Brasslands” also goes across the sea to the music’s burgeoning frontier, where a band from New York City, Zlatne Uste, is preparing to go to Guca for the competition — a mere decade after U.S. bombs rained down on Belgrade. The film screened in November at the Three Rivers Film Festival, and did so well that Pittsburgh Filmmakers is bringing it back for an extended run. Pogoff felt drawn to the music, and knew he wanted to do something with it for a long time. Michael Machosky is a staff writer for Trib Total Media. He can be reached at 412-320-7901 or mmachosky@tribweb.com. Balkan brass has more than a foothold in Pittsburgh, with bands like Lungs Face Feet and the Pandemic DJ night at Brillobox turning younger crowds onto the music. Pandemic DJ Pete Spynda is doing a crowd-funding campaign (through indiegogo.com) for the Pittonkatonk Pittsburgh May Day Brass Festival and BBQ on May 3 at the Vietnam Veterans Pavilion, Schenley Park, Oakland. The event will feature bands from all over the country, including What Cheer? Brigade, Timbeleza, Detroit Party Marching Band, Lungs Face Feet and Black Bear Combo.